As Batman and the Justice League of another world move to rescue his counterpart, Harley Quinn breaks into the Hall of Justice with murder on her mind. Specifically, she plans to kill The Joker of the other Earth. 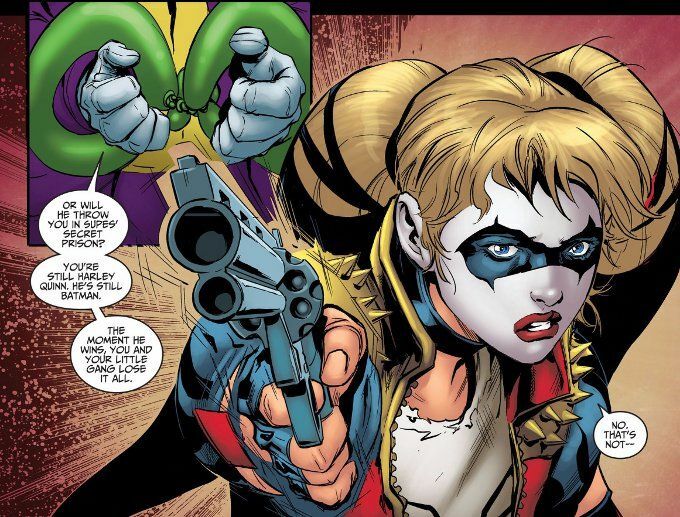 When push comes to shove, can she really follow through on ending her 'Puddin? This series suffers the more it focuses upon retelling the story from the game. The script by Christopher Sebela isn't bad but repeating a story that most of the people reading this series already know can't compete with the original material focusing on Harley's antics. If nothing else watching Harley in action is more interesting than Harley talking about what other characters are doing. The artwork seems similarly weaker this time around as well. Pop Mhan is a good artist but several of his panels here seem rushed and sketchy. Most of them look fantastic, however, and there's some great spreads throughout the book, finished perfectly by Mark Roberts' colors.